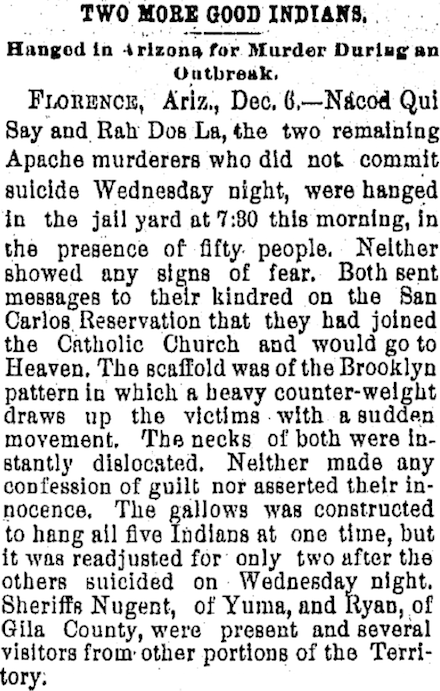 Two of eight Apaches — Nacod Qui Say and Rah Dos La, among other possible transliterations — who murdered an Arizona sheriff and deputy while escaping from a transport to the penitentiary were hanged on this date in 1889. 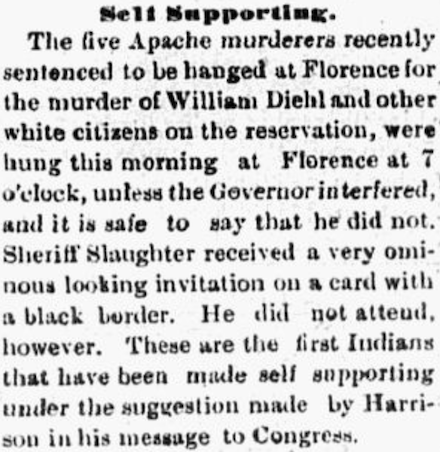 Tombstone Prospector, Dec. 6, 1889. Meanwhile, in the spirit of the old saw that “the only good Indian is a dead Indian,” a wag at the following week’s San Diego Weekly Union did Tombstone one better in the racist headline department. * Arizona didn’t attain statehood until 1912; prior to that it was federally administered and the last word on clemencies and commutations belonged to the U.S. President. On this date in 1548, Francesco Burlamacchi lost his head … for a united Italy? 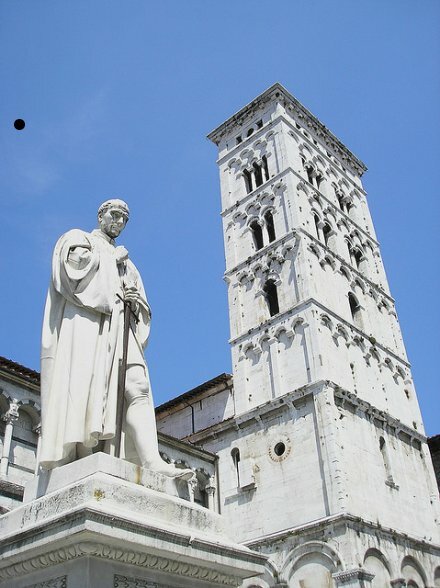 A humanist patrician with a soft spot for Plutarch, Burlamacchi had orchestrated a bid to break away an independent federation of Tuscan cities — Florence, Pisa, and his own city of Lucca. The dream of the Republic and liberty lived long after Rome’s legions had ceased to tromp. It’s just that said dream got reliably tromped over whenever it threatened to materialize in reality. Against this likely formidable opposition, our plotter counterpoised an astonishing rolling-putsch plan. Pretty ambitious. Or optimistic. Or … bonkers. Once the impossible dream plot was betrayed from the inside, Duke Cosmo, as the most direct target of the intended march, wanted Burlamacchi delivered to his own hands for interrogation and punishment; the elders of Lucca could not do this without making an impolitic show of submission to their neighbor. ** Charles V resolved the impasse by taking Burlamacchi to the imperial seat of northern Italy, Milan, and cutting his head off there. Accordingly, with the (proto-)unification of Italy, Tuscan sculptor Ulisse Cambi was commissioned to produce a monumental statue of Francesco Burlamacchi. This would-be Aratus still keeps watch on Lucca’s Piazza San Michele. (cc) image from alphaorionis. Note that, according to The Renaissance in the Streets, Schools, and Studies (whose chapter “Fortune’s Fool” by Mary Hewlett was invaluable to this post), the historical Burlamacchi actually never carried a sword and hated bloodshed. * The confederated city-states model was really big in the family. Burlamacchi’s teenage — at the time of the execution — son Michele later emigrated to Geneva, in the Swiss Confederation, and converted to Calvinism. ** Lucca was declining as a power at this time, and all the more insistent about jealously guarding a maximal appearance of sovereignty. The city-state’s major project in the 16th century was throwing up city-girding defensive walls meant to preserve her independence. 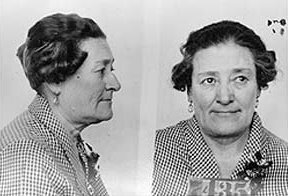 On this date in 1930, Eva Dugan was badly hanged. A former Alaskan cabaret performer, Dugan relocated to warmer climes, took a job keeping house for a to New York. A mysterious teenage accessory, “Jack”, was never found. Eva was picked up and extradited after the missing rancher’s remains turned up in a shallow grave. The grizzled former frontierswoman — she followed the Klondike gold rush in her youth — took her fate nonchalantly. Eva Dugan’s health may have been full — though she bid unsuccessfully for clemency claiming mental illness — but her body was halved. At 5 a.m. this date, wearing a homemade silk shroud, a composed Dugan mounted the gallows at the state prison in Florence. Her death was instantaneous, for the rope, when it snapped at the end of the drop, severed her head from her body. Five witnesses, two women, fainted. Altogether there were five women in the chamber at the time of the execution. It was the first time in the history of Arizona that an execution was witnessed by women. Thanks in part to this ghastly scene, Arizona in 1934 replaced the gallows with the western states’ hot new killing technology, the gas chamber … leaving Dugan the last female client of that state’s hangman. On this date in 1479, a fugitive of the previous year’s Pazzi Conspiracy — an ill-starred attempt by the Pazzi family to overthrow the Medici — was hanged in Florence. Must’ve been a sight to see. Giuliano wound up dead, but the rest didn’t work out so well. Baroncelli, however, managed to evade the resulting paroxysm of civic vengeance and hightail it to Ottoman Istanbul, where he had some contacts. Unfortunately for Bernardo, Florence had some contacts there, too. Ottoman relations with the various Italian city-states were actually quite strong, and Florence in particular enjoyed lucrative trade arrangements bringing its wool textiles to Bursa to exchange for silk. By letters of Bernardo Peruzzi we have learned with great pleasure how that most glorious prince [Mehmet] has seized Bernardo Bandini, most heinous parricide and traitor to his country, and declares himself willing to do with him whatever we may want — a decision certainly in keeping with the love and great favor he has always shown toward our Republic and our people as well as with the justice of his most serene Majesty … although as a result of the innumerable benefits done by his most glorious Majesty in the past for the Republic and our people, we owe him the greatest indebtedness and are the most faithful and obedient sons of his Majesty, nevertheless because of this last benefit it would be impossible to describe the extent to which our obligation to his most serene Majesty has grown. 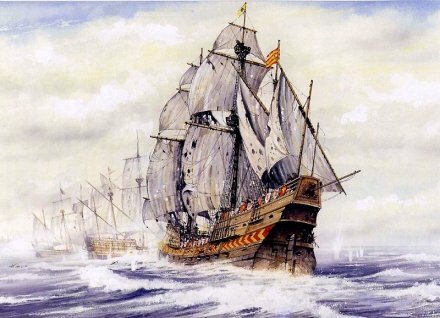 A Florentine representative quickly sailed for the Ottoman capital to make the arrangements, and returned with the hated Bandini on Dec. 24. Five days later, he was hanged over the side of the Bargello. Florentine native son Leonardo da Vinci sketched the hanging man (the sketch is now in the Musee Bonnat), diligently noting his clothing. A tan colored skull-cap, a doublet of black serge, a black jerkin, lined and the collar covered with a black and red stippled velvet. A blue coat lined with fur of fox’s breasts. In the video game Assassin’s Creed II, one of the missions (assigned by Giuliano’s surviving brother, Lorenzo the Magnificent) is to kill Bernardo Baroncelli … but not with trade relations and diplomacy. * Conqueror of Istanbul/Constantinople, among other things.